We had been regular Sunday Mass attendees – but admittedly “flying under the radar” – for seven years when our pastor, Fr. James E. Clark, asked us to step forward and lead a new program called Living the Eucharist (LTE). Whatever trepidation we might have felt at leading our parish in the daunting goal of growing closer to God through an improved understanding of the Eucharist quickly melted away when we launched into our duties. We (John – an engineering firm president, and Teri – an author and historian) were determined not to let any nervousness we might have initially had stand in the way of doing our very best to deliver this exciting faith-sharing experience to our beloved parish. We quickly learned that among the many keys to our success in creating a meaningful LTE program at Corpus Christi for the first of what would be a three-year annual Lenten experience was a dedicated and dynamic team. Fortunately for us, the fabulous people who formed our Parish Leadership Team were enthusiastic and talented – managing the Adult Small Group, Teen, and Family components, carrying out communications, liturgical coordination, and administrative tasks with skill and brilliance. 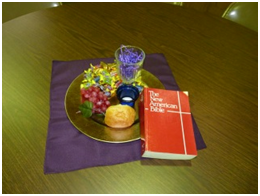 The photo, taken by Eileen Earle, a member of the Corpus Christi Parish Leadership Team, shows the centerpieces the team created for the tables at the Living the Eucharist Parish Retreat. Educating our fellow parishioners about Living the Eucharist and the benefits of it for Corpus Christi, both for our church community and for the individual congregants, was a high priority as we began our LTE planning season in the fall of 2012. By the time Sign-up Sundays took place in January 2013, our parishioners were well-informed and eager to dive in to the new and appealing program being offered to us by Paulist Evangelization Ministries. As the only parish in the Albany Diocese to be embarking upon LTE last year, we felt proud and privileged to move ahead with raising awareness of how to unwrap the divine mystery of the Eucharist and to make it a living, breathing part of our daily lives. When our LTE program got underway for Lent 2013, we had 310 adults, teens, and children enrolled in the various small group and family components. We on the Parish Leadership Team, and Fr. Jim as well, were elated! This rate of participation was a hefty one-third of Corpus Christi’s total “active” attendees. And, we were thrilled to have encouraged some of the members of our “Landings” program (for inactive Catholics and seekers) to join in as well. Countless more of our adult parishioners beyond the 310 participating in the faith-sharing groups were able to enjoy the LTE experience and grow closer to God by reading the magnificent daily devotional, From Exodus to Easter. At every level of participation – adult, teen, family, and child – the feedback we received let us know that Corpus Christi had indeed been given a most precious gift in the form of Living the Eucharist. Sound training by our small group coordinators had allowed group leaders the flexibility to tailor the weekly get-togethers in such a way as to maximize the spiritual and religious lessons and the sharing between group members. Teens had become leaders and guides to one another in learning more about the Eucharist. Parents had nurtured stronger bonds of faith with their children through teaching about the Mass and the Word of God. Likewise, the bonds of friendship and service to God that were formed among those of us on the Parish Leadership Team have been rich and long-lasting – and especially glorious as we now are reconvening to begin our planning for LTE 2014 – determined to raise our participation goal to 500 for the coming Lenten season. As co-leaders of this richly rewarding program, we have felt tremendously blessed to serve the Lord together as a couple, and this has led to an even deeper level of love and commitment between us in our marriage. It is truly magical to see Living the Eucharist “in action” and to witness the Holy Spirit alive in our midst at Corpus Christi, helping us to grow in our Catholic faith and to strengthen our bonds with one another as fellow parishioners and as disciples of Jesus. Editor’s note: You can learn more about Living the Eucharist at www.LivingtheEucharist.org.